We all have our own version of the perfect burger. And we’ve probably grilled it more than we care to admit over the past few months. Now it’s time to step out of your burger comfort zone and graduate to some burgers that stretch not just your jaws, but your imagination. We give you: an American inside-out cheeseburger, a Greek-style ground lamb burger, and a Thai flavor ground veal burger. You can make these burgers with me while watching Project Smoke Season 3! Head over to http://www.projectsmoke.org/home/ for more information on local air times and watching online. 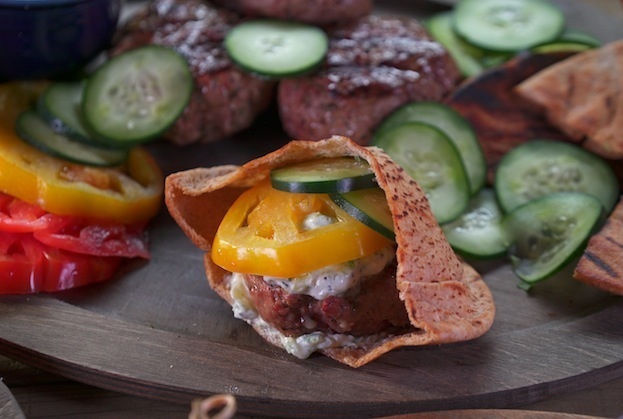 Think outside the bun and serve this ground lamb patty in a grilled pita. 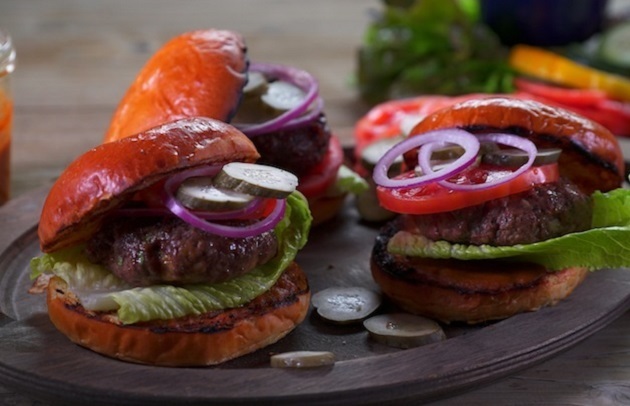 The full, rich flavor of the lamb combines with the onion and yogurt sauce to create a uniquely flavorful Greek-style take on a burger. A wholly American take on the burger, my inside-out cheeseburgers solve the dilemma of cooking a burger to the FDA-recommended internal temperature of 160 degrees without drying out the meat. As these burgers grill, the cheese inside the burger patty melts and keeps the burgers moist. And the made-from-scratch ketchup puts this modern take on the classic cheeseburger over the top. 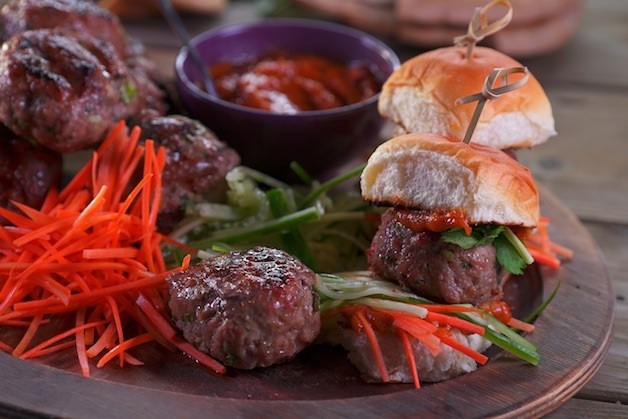 Lean, mild, and sweet veal makes a terrific burger, and when you combine it with traditional Thai ingredients like kaffir lime leaf and fish sauce as well as freshly minced ginger, the aromatics are fantastic. After loading up your burger patty on a grilled Hawaiian roll and piling it high with Thai peanut sauce, carrots, cucumbers, and cilantro–you’ll need both hands to eat this burger! How are YOU mixing up burgers on the grill? Share with me on Twitter, Facebook, and Instagram.